Myakka River Trails is one of the most unique communities in Venice, with its setting and expanse akin to a state park. This community spreads off North River Road, with its eastern boundary stretching for nearly two miles directly adjacent to the Myakka River. The 10,000-acre Deer Prairie Creek Preserve is likewise a close neighbor to the homes for sale in Myakka River Trails. To the southwest, the community’s acreage is just a short distance from the quadrants of West Villages Parkway and South Tamiami Trail (U.S. 41), one of the local growth centers driving market interest in Sarasota homes for sale. 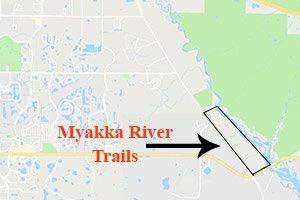 Myakka River Trails was developed as a private, gated community with 60 home sites ranging between five acres and 15 acres in size. Residences have been built in more than 40 of these lots. Most are elevated up to 8 feet and nestled amongst lush tropical greenery. None of these houses are directly waterfront, but instead, those closest the river have long, elevated boardwalks. These walkways lead to plain wooden docks over the wetlands at the properties’ rear to the reedy riverbank. Myakka River Trails is a deed-restricted community, and its residences must have a floor space of at least 3,000 square feet under air. The deed restrictions also set front and rear setbacks at 250 feet and side setbacks at 50 feet to ensure privacy. 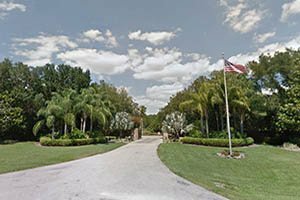 The residents share several common facilities including horse trails, a clubhouse, lighted tennis courts, playground, swimming pool, and a boat ramp on the Myakka River. 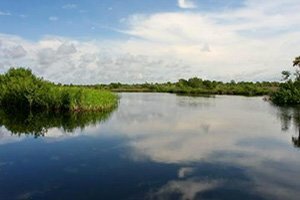 At certain times, the river’s water notably turns brackish, hence fishing in its waters could bring in catch of both saltwater and freshwater fish. The community also features a large lake near its main gate to lend an added rustic charm within the property. Given the vast acreage of their community, the residents of Myakka River Trails enjoy plenty of space and a quiet, refreshing environment. In the upper floors of select Myakka River Trails homes for sale, the view stretches for miles without any other structure in sight. The lush shade trees and natural vegetation in home sites and common areas attract local wildlife, such as birds, bobcat, raccoon, and deer. Prospective buyers can find varied residential options amongst Myakka River Trails homes for sale. Most of the residences in the community are of custom design constructed by its designated builders which includes local heavyweights, such as Arthur Rutenberg, Peterson, and John Cannon Homes. Myakka River Trails homes for sale can range between 3,500 and 12,000 square feet, with those with the smaller square footages featuring three to four bedrooms. Those leaning on floor spaces of over 10,000 square feet would typically feature six bedrooms and six baths, with their asking prices quoted in the million-dollar range. Although the community is such an upscale neighborhood, there are surprising finds here of homes priced starting from the high $500s. The West Villages mixed-use development just two miles south from Myakka River Trails is a weighty factor for potential home buyers in this community. The spring training camp of the Atlanta Braves opens in 2019 includes a new sports complex at the West Villages Parkway. Following too is a nearby commercial center anchored on a Publix Supermarket. Below are the current real estate listings available in Myakka River Trails.